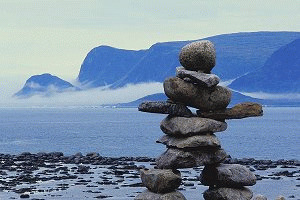 These communities, located above the Arctic Circle, are all exceptional places from which to discover the Northwest Territories. North of the treeline is the Arctic Tundra, where nothing interrupts the silence but the wind, and the roaming animals who call it home. Build an igloo, ride a dog sled, golf on an arctic island, get to know the northerners who love their arctic homes. Book accommodations in the Arctic Coast, and become one with the snow! The town that was once the administrative center of the Western Arctic Region is only accessible by air from Inuvik or by ice roads in the winter. The transportation hub of the north, Inuvik offers visitors an idea of community life above the Arctic Circle. Check out the igloo-shaped church, Jak Territorial Park, as well as the local houses on stilts. Visit Fort McPherson, near the Yukon border, where the Royal Northwest Mounted Police had an important base in the early 20th Century. You're nearing the edge of the world here! Explore the Pingos (nearby arctic permafrost hills), dog sled over the snow and ice, and view the spectacular Northern Lights as they dance in the midnight sky.